10-Minute Toughness is a solid mental training program. In fact I feel it is the best of its kind. . . . [It's] what the title says: ten minutes a day that connects your talents and abilities to the outcome you're seeking. As a retired NFL player looking forward, I can see as many applications for the toughness Jason Selk's program brought out of me in the business world as there were on the foot… ball field. --Jeff Wilkins, Former NFL Pro Bowl Kicker The mental side of the game is extremely important. 10-Minute Toughness helps the players develop the mental toughness needed for success; it really makes a difference. --Walt Jocketty, General Manager of the 2006 World Champion St. Louis Cardinals Jason Selk has spent a tremendous amount of time and energy developing effective mental-training programs and coaches workshops. He is truly committed to helping individuals and teams to perform at their very best, when it really counts. --Peter Vidmar, Olympic Gold Medalist Mental training is a must for high performance both on the field and off. But simply hoping for mental toughness isn't going to build any mind muscles. You need a proven routine of daily exercises to get you where you want to go. 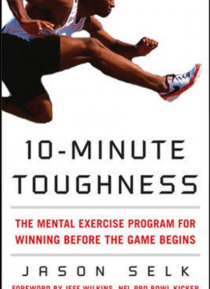 10-Minute Toughness is your personal coach for boosting brainpower and achieving a competitive edge in whatever game you play. With quickness and ease, you'll learn how to master your own mind and psych out your opponents using personalized techniques from one of America's most successful sport psychology consultants. Like no other program available, the 10-Minute Toughness (10-MT) routine gets you ready for the competition in just ten minutes a day.